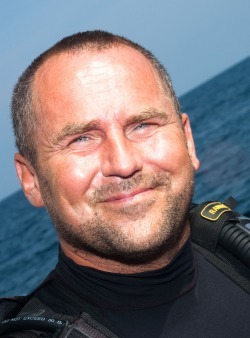 Jorn Ari was born in Denmark in 1966, but it was not until the age of 40 he got his first scuba dive. It took place on a vacation in Egypt, Sharm El Sheik in the autumm of 2006. A whole new world opened up for him when he saw the amazing myriad of life and colorful coral below sea level. The following year he became a Divemaster and continued to become an Instructor in February 2009 which led him to become a Staff Instructor. On a trip to the Maldives in 2007 he brought his first underwater camera. It was an Olympus compact camera and he shot anything that moved underwater. He took many pictures with the greatest zeal and enthusiasm. By the end of 2009 the time was in to take the step and replace the compact camera with a D-SLR. The choice was not surprisingly an Olympus, specifically E-420. The collection of images started to pile up so he decided to share them with the public. January 2010 went with building a website which was published nearly one month later. The site is constantly changing, as Jorn Ari regularly creates new initiatives and improvements. His greatest desire is to learn even more about underwater photography, marine biology and naval history.